A while back, I did a round-up regarding international affairs and their calamitous bungling, in recent weeks. But I left you with the impression that war with Iran might happen because of “stumbling,” as described here in The Atlantic. But in fact, things are far worse. It appears that a confluence of pivotal world leaders want this to happen. Are these four nations all enemies of the U.S.? Heck no. One of them is an “ally” - Saudi Arabia. Another is best pals with our president - Russia’s Putin regime. The other two may shock you. They are the United States and Iran. But eight years of almost-perfect safety, under Obama, has made paranoiac fear very hard to push, outside their fanatical base. 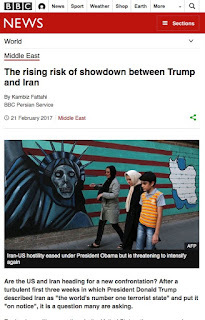 Both Trump and the mullahs would benefit - domestically - from some kind of crisis — war, or a “Reichstag fire” — to reverse their slide. The Saudi position is even simpler — and more shortsighted. They rightfully fear the rise of a Shia empire, arcing through Syria and Iraq and Iran to Bahrain and their own non-Sunni coast. But they believe rattling sabers and even hurling bombs will prevent this, even though such things have only strengthened the Ayatollahs, every single time. And in the event of a major conflict, the Persian regime will just cling for protection to their next door neighbor — nuclear armed Russia, sealing their nascent alliance. Hence, of the four, the only one wanting an Iran-U.S. War for clever reasons is, of course, Vladimir Putin. And well, we all know about his puppet strings to you-know-who. Find all this implausible? Look at the foreign affairs team appointed by Trump, from Tillerson and Bannon on down. Every single one of them has called for confrontation with Iran, which would only undercut the democracy movements among Tehran’s rising middle class. There are no exceptions. Every… single… one of Trump’s people have spoken glowingly of struggle with “Iran,” ignoring the fact that a majority of its people want to join the modern world. Of course there is a final ingredient -- removing Iranian oil from world supply would instantly boost prices for... well, guess whom. You can see this in the recent Travel Ban, which fiercely clamped on not just Iran (which - despite a lot of noise - has done us very little tangible harm, since 1980) but also our supposed best Shia ally — Iraq. Moreover, there was word recently that the Trump Administration wanted to fire at an Iranian military skiff near Yemen, but was stopped by cooler heads. Only, what if the mullahs order more skiffs to charge ever closer? How long before we see some sort of Gulf of Tonkin incident, that serves the interest of both sets of rulers? But that is where both the mullahs and the Saudi royals might balk. Certainly the Israelis, who know that Tehran already has a bomb. And they know where it's aimed. There is no other conceivable reason to eliminate a voting-fraud-preventing agency that costs next to nothing, in a year when everyone is screaming about "voter fraud." The reason is simple. The GOP intends to do even more election fraud. It is a matter of survival. Meanwhile, the president endorsed civil asset forfeiture, which lets police seize even innocent people’s property. Hey libertarians! Add this to the one hundredways that Republicans are vastly, vastly worse than democrats for freedom. And any libertarian who chooses the GOP as his "hold my nose" choice or lesser of two weevils, is an utter dunce and traitor to Adam Smith. 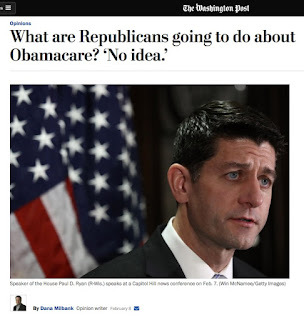 "For seven years, opponents of the Affordable Care Act vowed to make its repeal their top concern, warning that the law would turn America overnight into a socialist dystopia. Now these opponents have unfettered control of the government and they aren’t even talking about repealing," reports Dana Millbank in The Washington Post. ... and now the max they are talking about is (1) tweaking a few fixes the dems were eager to negotiate, and (2) changing a lot of the names of things! Renaming the program and its parts. And you dopes will swallow that. You'll swallow anything you're told. BTW... see here why GOPpers actually think that names matter more than substance. Hayley Miller reports that despite the Trump administration’s renewed focus onfossil fuels, a new Pew poll says two-thirds of Americans favor a path to a renewable energy future. Writing from Hong Kong, Li Jing reports that Chinese officials say they are prepared “to take a leadership role” in defending the Paris climate accord no matter what the new Trump administration decides to do. Combat readiness — I've long pointed out that it plummeted for the US military under both Bushes and raised up to almost 100% under Clinton and Obama. One member of this blog community reported: "There are elaborate systems that track readiness: SORTS and DRRS. When I was reporting for my unit, it was on a classified system, and we would evaluate our ability to conduct our mission vs our 'Designed Operational Capability (DOC) statement'...usually we had minimum number of qualified and current personnel and mission capable equipment. If we were good to go, we were "C1" if not, we might be marginal or some degradation "C2", but always tried to avoid not mission capable "C3" or worse C4." Definitions: Department of Defense Readiness Reporting System (DRRS), improved upon by Status of Resources and Training System (SORTS). Candidate Donald Trump was a big fan of leaks, especially when they targeted Hillary Clinton and reports of her deleted emails. "Russia, if you're listening, I hope you're able to find the 30,000 emails that are missing," Trump said last July in Florida. "I think you will probably be rewarded mightily by our press." Is Ohio Governor John Kasich gearing up for a primary run against Donald Trump in 2020, as this article suggests? Or is something more immediate and bold afoot? Someone report here if you notice Kasich meeting with McCain, Murkowski, Portman, Collins, Graham and others. It’s too soon. But something bigger may be back-burner simmering. Evan McMullen tried, hard, to help the folk of Utah to spurn the recent collapse of American conservatism. Had they listened, they might have escaped direct, shared responsibility for this calamity, instead of lining up with the most opposite-to-Jesus set of leaders America has ever seen. Well, McMullen and his minority of followers continue to stand up. They might seed a new American conservatism – an adult kind – to rise from the coming ashes. Trump makes false statements about U.S. murder rate to sheriffs’ group. The president claimed the country’s murder rate is the highest it’s been in 45 to 47 years. But the rate actually is almost at its lowest point, according to the FBI. You who are complicit and making excuses for this. You are flirting with madness and riding a rabid tiger. Meanwhile (same day) -- Open-carry advocates walked into a police station with a loaded rifle. Officers were not amused. Seriously, after declaring open war on the US Military and Intelligence officer corps, now the alt-right is doing everything in its power to bully police. Seriously? You had those conservative-by-personality clades safely republican, some years ago. Now the cops & spooks and generals are fleeing, like every single other knowledge and fact-based profession. Having a blog community can be handy. One of my commenters (and I have the best) went and appraised how many cabinet members recent presidents have chosen from states on which side of the Civil War. Obama's initial cabinet: 3 Westerners, 1 Confederate, 10 Unionists. G.W. Bush's initial cabinet: 1 Westerner, 5 Confederate, 9 Unionists. Clinton's initial cabinet: 2 Westerners, 6 Confederates, 6 Unionists. Bush the Elder's cabinet: 3 Westerners, 4 Confederates, 7 Unionists. Reagan's initial cabinet: 2 Westerners, 1 Confederate, 10 Unionists. Carter's initial cabinet: 2 Westerners, 4 Confederates, 7 Unionists. Nixon's initial cabinet: 3 Westerners, 1 Confederate, 8 Unionists. Reagan’s was the most tilted in favor of the Union, followed by Obama. Trump’s is by-far the most tilted toward former Confederate states. Conclusion: There is a statistically significant bias against the Union and in favor of the Confederacy in choices for Cabinet members. Of course there are quibbles. Indiana long ago stopped being for the Union and Virginia is ditching Dixie. Many Western states are confederate hotbeds. Still…. The struggle for our civilization will be a long and complicated one, especially as our greatest weapons – facts – have been undermined with clever - though ancient - appeals to tribalism. It appears we shall have to slog through refutation after refutation. Of course one reflexive answer is obvious – the halcyon 1950s of “Happy Days.” Only notice that it’s never actually said, in order to avoid the unfavorable comparisons that I make here: Was 1957 America Better Than Today? In fact, you get nowhere by denigrating the 1950s. What’s vastly more effective is to lead these nostalgic folks out onto a limb, getting them to express admiration for the “Greatest Generation” that endured a depression, crushed Hitler, contained Stalinism, went to the Moon, spanned the continent with infrastructure and universities, and built a market economy so strong and rich that we could then afford to take on a myriad old sins, like poverty, racism, sexism and planetary neglect. Do the Greatest Generationers deserve our gratitude and respect? Sure! Might they have been better and greater than their boomer children? Well, sure… maybe… though that insults them as having been poor parents. Still, yes, those men and women of the Greatest Generation truly were great! Only, didn’t they achieve all those mighty things at high tax rates on the rich? And with fierce regulation of banks and monopolies? Weren’t all those mighty accomplishments of the 1940s, 1950s and 1960s achieved with strong labor unions? With intense national respect for teachers and scientists? Wasn’t that when the most trusted American was a journalist (Edward R. Murrow, followed by Walter Cronkite), the most admired was a scientist (Jonas Salk), and the most beloved – by far – was Franklin Delano Roosevelt? Given that not a single promise ever made by Supply Side Economics ever once came true, is the prescription for making America Great again truly to reverse every single thing that the Greatest generation did and believed in? Okay, some tactics should be beneath us. Still, one can get a chuckle out of this site that will connect you by phone to some Trump business venture, around the world, so you can do what foreign leaders and oligarchs already can do… talk policy through the back door of DT’s businesses. Counter-factual drivel abounds: "Unlike his predecessors, Trump is serious about winning. To do so, he is even willing to take the radical step of accepting Israel as an ally." See where I long ago discussed how Republicans and Democrats wage war. The Turkish Parliament passed constitutional amendments last weekend that could allow President Recep Tayyip Erdogan to amass unprecedented power. “Let me tell you what is coming. After the sacrifice of countless millions of treasure and hundreds of thousands of lives, you may win Southern independence if God be not against you, but I doubt it. I tell you that, while I believe with you in the doctrine of states rights, the North is determined to preserve this Union. They are not a fiery, impulsive people as you are, for they live in colder climates. But when they begin to move in a given direction, they move with the steady momentum and perseverance of a mighty avalanche; and what I fear is, they will overwhelm the South." -- Sam Houston, denouncing the Texas convention’s decision to secede, in 1861.